Binh Dinh (Bình Định) province has been known as the land of beautiful landscape and Vietnamese traditional martial arts. Also, it is the birthplace of King Quang Trung (Quang Trung) who was the leader of the Tay Son (Tây Sơn) Uprising at the end of the 18th century. To save the memorable history of that time and for people to show their gratitude toward the natural hero, Quang Trung Museum (Bảo Tàng Quang Trung) that is located in Kien My (Kiên Mỹ) Village 40km west away from Quy Nhon (Quy Nhơn) city was built. Becoming a must-see tourist attraction in Binh Dinh, Quang Trung Museum is gaining the interest and curiosity from Vietnamese, foreign researchers and many professional researchers. Most tourists often combine Quang Trung Museum with other attractions of Quy Nhon when they have a great chance to visit Binh Dinh province. 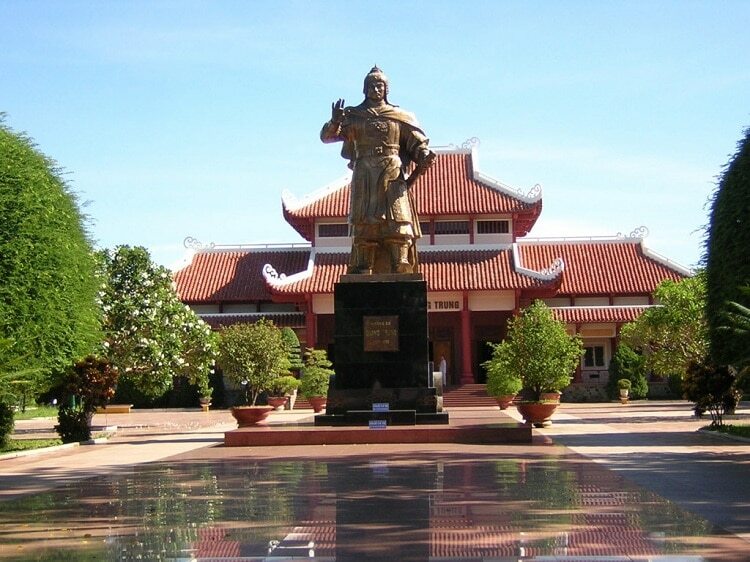 Therefore, the suitable time for you to visit Quang Trung Museum depends on your trip schedule to Quy Nhon, Binh Dinh. The weather in Quy Nhon, Binh Dinh province is pleasant from April to September which is also the months Quy Nhon receives a large number of tourists across the world coming to visit. The museum opens for tourists on all days of the week, in the morning (from 7 a.m. to 11 a.m.) and in the afternoon (from 1 p.m. to 5 p.m.) with the fee of 10,000 VND for one person. Going to Quang Trung Museum on January 1 (Lunar Calendar) every year is also a great experience because you will have a chance to watch people hold Dong Da (Đống Đa) ceremony that commemorates the leader of Tay Son revolt. 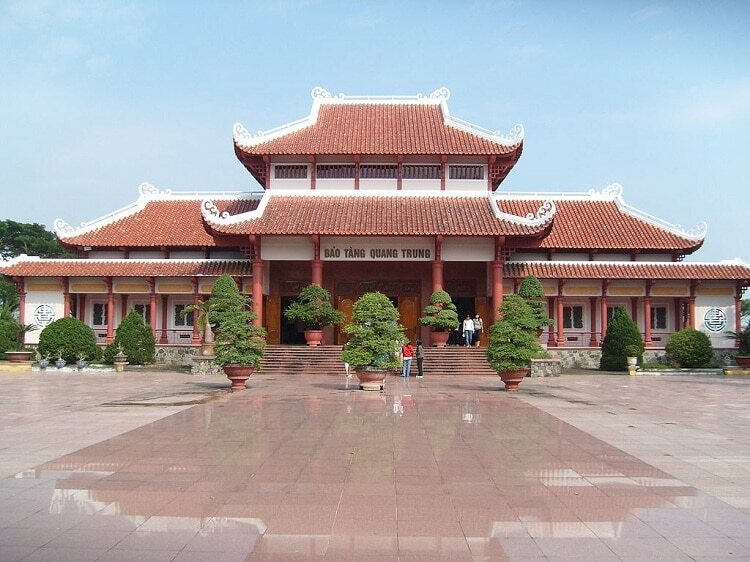 Quang Trung Museum was built in 1978 to preserve the 11,000 important objects associated with the historical relics of the Tay Son Uprising and the remains of three Nguyen brothers including Nguyen Lu (Nguyễn Lữ), Nguyen Hue (Nguyễn Huệ), and Nguyen Nhac (Nguyễn Nhạc). Being 45km far away from Quy Nhon city center, every day this museum welcomes a large number of visitors and researchers who come to learn about Vietnamese history. On the center of the museum is the Quang Trung – Nguyen Hue (Quang Trung – Nguyễn Huệ) monument. A three-door gate is located in front of the yard and next to is the stele house of King Quang Trung with a unique structure. There are three halls in the main hall that honors three Nguyen brothers. Tay Son generals like Ngo Thi Nham (Ngộ Thị Nhậm), Bui Thi Xuan (Bùi Thị Xuân), Ngo Van So (Ngô Văn Sở), Tran Quang Dieu (Trần Quang Diệu), Vo Van Dung (Võ Văn Dũng), Tran Van Ky (Trần Văn Kỷ), etc are worshiped on both sides of the sanctuary. In the old garden outside the shrine, there are the old tamarind trees and the 300-year-old well. The tamarind tree has become the typical symbol of Tay Son Uprising vitality and the old well nowadays still gives fresh and clear water. Visiting the museum, you should try sitting under the old tree and drink the sacred water from the well, which would be a great experience for tourists. It will be an omission if you visit the museum without stopping at the exhibition house. In Quang Trung Museum Tay Son, the exhibition house has more than 11,000 important documents and objects related to Tay Son and Quang Trung. It is a great opportunity for you to understand the Vietnamese history. This house is also a storage place of traditional martial arts of Binh Dinh such as drums made of elephant leather, ancient coins, bronze bells, etc. Finding accommodation near Quang Trung Museum may be difficult because, in this area, there are a few options and some hotels or homestay are far from this site. The nearest hotel is Crown Retreat Quy Nhon (7.8km from Quang Trung Museum) but it has an expensive cost (AU$124 per night). Alternatively, you can reach and stay at the AVANI Quy Nhon Resort & Spa (45km away), Royal Hotel and Healthcare Resort Quy Nhon (35km away) or Cendeluxe Hotel – Managed by H & K Hospitality (100km away). Most hotels near the Quang Trung Museum has the price of over AU$12 per night that can be changed due to additional terms, time and other possible factors. If you have a chance to visit Quy Nhon, Binh Dinh province, it is a great idea for you to enjoy a lot of seafood and specialty at a local restaurant before coming back to your busy life. There are many must-taste foods such as fish noodle, “jumping shrimp pancake, jellyfish noodle, grilled nem, and even Vietnamese rice pyramid dumpling. We have to stay that the Quang Trung Museum is not only a historical site but also a tourist attraction in Binh Dinh province. Coming here, tourists will understand more about the glorious history, the courage and strong spirit of the Vietnamese people. If you like this destination, please don’t hesitate to think of a wonderful and memorable trip to Quang Trung Museum. To know more about Vietnam travel, visit our Vina homepage.